One of the substances referred to as a natural black skin care ingredient is Shea butter. Not only does it come from an African-grown tree, the Karite Nut tree, but it is also a highly sought after African American skin care ingredient. No wonder, it's no surprise that black skin is naturally complemented by Shea butter. You can find many skin care products intended for the African American market with Shea butter as an ingredient. The Shea butter we know of is a natural fat that came from the nut of the same tree. It is either ivory or yellowish in color. In Africa, it is not only known for cosmetic and medicinal purposes but also for culinary, wax or candle-making and for hairdressing. Outside the continent though, it is mainly used for cosmetics because of its rich, moisturizing property. Many people from all over the world appreciate the beautifying effects of Shea butter. For the skin, black skin in particular, you would find it a great solution for ashy skin. 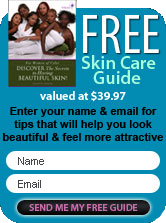 Ashy skin is mostly experienced as a result of dead skin accumulating in the epidermis. If you are not exfoliating regularly, this could happen. Vitamin A in Shea butter guarantees younger looking skin longer, because it firms your skin and prevents wrinkles. Perhaps it is the continuous use of Shea butter that makes black people look younger than fair-skinned people of the same age. Shea butter can also prevent rashes and help in healing stretch marks, scars, burns and bruises. Blemishes can destroy the evenness of skin tone in black skin because it leaves dark patches after the redness. As mentioned above, it has medicinal properties too that can cure skin diseases like eczema, dermatitis and athlete's foot. The great thing about Shea butter is that like most natural substances, it can be applied even to the most sensitive of skin - baby skin. Use Shea butter to prevent skin irritation on babies. In fact, Shea butter is not only a natural black skin care ingredient but also good for hair and nails. One caution on using Shea butter is to apply in moderation as it is a very oily substance. Also, avoid areas like your eyes and nose to prevent clogging of your skin. Blended with cocoa and mango butters, you can maximize its conditioning effects. Lastly, buy Shea butter that is void of preservatives and other synthetic ingredients because it's best used in its pure form.